"Our current society has evolved into an increasingly interconnected world through the 8.4 billion networked devices (as of 2017) that have become tools of survival in our modern lives. Personal data is constantly uploaded to these networks and a real-time stream of information and images that narrate our identities is available. The algorithms of these networks become filters for these narratives. altering the perception of our identities. The feedback, authentication, and traits of our identities within these digital networks have a very real influence on the psychological interpretation of ourselves. This alteration of our identities through networks is largely invisible, yet it creates very real barriers and conceptual walls, which we have to navigate in order to access. " 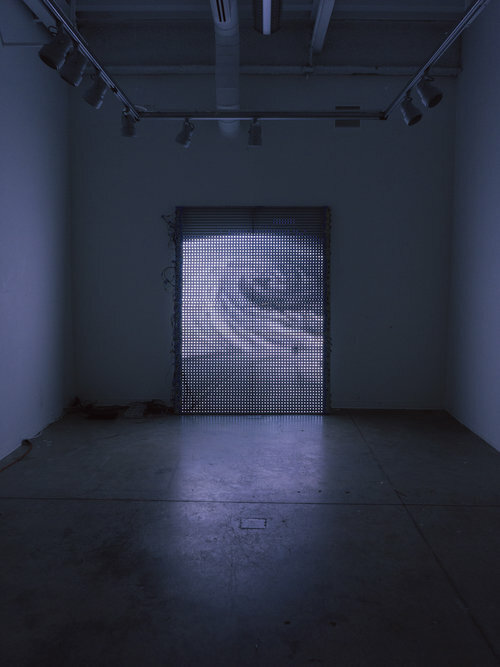 "By allowing viewers to see their own images which are uploaded to a transparent light panel through the internet, the algorithms and code contained in this work allows viewers to interact with algorithms in a transparent and visible way that is more akin the reality of the ways in which algorithms reorder and classify our identities without our knowledge. "